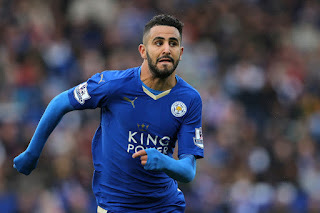 Arsenal fans began calling for Arsene Wenger to go all out for Riyad Mahrez following reports that the Leicester City star is unwilling to sign a new deal at the King Power Stadium. The 25-year-old scored 18 goals in all competitions last season as the Foxes stormed to the Premier League title and the attacking midfielder was named the PFA Player of the Year. Ahead of Euro 2016, the Gunners triggered the release clause of Mahrez’s team-mate Jamie Vardy but the England forward decided to instead to agree a new four-year contract with Claudio Ranieri’s side. However, with Chelsea understood to be closing in on the transfer of N’Golo Kante, it appears Mahrez could also be on the hunt for a new club in the lead-up to the 2016/17 campaign. Gooners are praying Wenger brings in attacking reinforcements before the season gets underway on August 14, with Granit Xhaka still the only first-team addition through the doors at the Emirates this summer.